I just became your 1596th blog follower! ...and, I'd love to get the mother of pearl necklace! My favorite piece is the dainty names, and I am a follower! I LOVE Love Actually! Honestly I do!! Just became a fan on Facebook! I am a follower! I really like the Eternity Heart, I would love to have me and my boyfriend's names on it! This site is so awesome! Just became a follower! Love your ideas!! Love Vintage Pearl! Mother of pearl and lots of others too! I'm a follower! Love your ideas, voted for you on top mommy blogs. My favorite on the vintage pearl was "a simple sweet-heart". I am a follower. Large layers. That is what i would get. Hi! I'm a follower and love your blog! I also love the Circle of Love bracelet. To pick only one favorite is so hard! I love the square names on a chain! I would choose the names on a ring necklace. Love, love, love the dainty initial hearts necklace and mama bird necklace! i love the dainty drop necklace, it's so cute! Love the Simple Sweetheart piece! It's just cute! I love the simple love with a copper heart!! My Faves are square names w heart and dainty drops!!! I follow your blog!!! I LOVE THIS BLOG. So many great ideas for me and my husband! I would get the dainty initial hearts necklace with me and my hubs initial. Thanks for this opportunity! I voted on Mommy blogs. 10!!!!! A cup of Love is perfect! I've seen a lot of these types of websites lately but this one has a great layout, beautiful pictures and unique items. I love the "a fused heart" necklace. Good thing I'm a follower so I can win! i love the handstamped keychains! I'm SO excited to have found this blog!!! :) And I LOVE The Vintage Pearl! My fav. piece that I've been eyeing (and hinting to the husband) is the simple dainty names necklace. I'd love it with my two little boys' names on it to wear around :)! I am now a follower, I am linking back from my blog, and my favorite is the bitty blossoms necklace but that does not begin to do justice to the affection I feel for this jewelry! I am in love! I've been looking for handstamped jewelry for bouquet decor for my wedding! I love "come fly with me"
I love the dainty drops, so simple! What a great giveaway!!! I really like Our Family Nest...it's sweet to have our family names close to my heart. i am a follower and I love your blog and your great giveaways. My favorite piece was the dainty eclectic necklace. Thanks!! Posted you button on my blog. http://the-winfields-7.blogspot.com/ Thanks!! Here's to hoping I win!! I am in love with "layered circls of love"...so beautiful. So glad you posted this website because I have been wanting one of these necklaces with my daughters birth stats. I follow the Love, Actually blog!! And LOVE IT!!! I love everything on The Vintage Pearl!!! The Circle of Love is my favorite!!! I'm a follower, and I love the oval shaped charm. I truly love their shop!! My favourtie piece would be the mother of pearl necklace! i like the initial necklace--simple yet beautiful! I did first two and 3 bonuses- my favorite pieces are the birthstone charms and the copper necklace w/heart in middle-I love your blog thanks for the giveaway!! I love the eternity heart! i love all of their things! beautiful! but i really love the layered circle with the baby footprints in the middle. just too sweet! I'm a Love, Actually follower! <3 this site. I love these and actually have one on my wist already! I love the dainty initial heart necklace. I'm a follower, and my favorite piece is Chunky Daisy Cuff. This stuff is really great! I love it all, and it was so hard to choose just one favorite. Love the circle of love! Oh my gosh I ADORE everything!! One of my favorites is the dainty initial hearts necklace. Thanks for sharing this cute website! I love your blog & I am a follower! 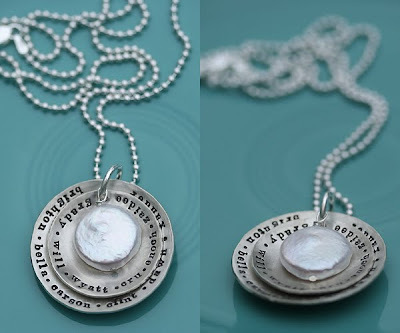 I would get the large layers necklace exactly as it is (with the baby feet and quote "You are worth it all) So perfect! I'm following your blog. Can't wait to check out all your fun ideas. My favorite piece of Erin's is the family nest. I rec'd that one for Christmas and I just LOVE it. My favorite piece is the "simple love with a copper heart." Thanks for pointing us to this website! I love the names on my heart piece! I'm a follower! I would love the dainty drops with my girls birthstone colors Diamond & Saphire!!! I'm a follower! Love the dainty drops with the birth stones! I am a follower! I love the a cup of love necklace! I also voted for you, became a fan on Facebook and have your button on my blog! I'd love the dainty drops necklace, so pretty! a flower and a circle, hammered star, come fly with me... pretty sure I love so many of these pieces if I had a gc it would be too hard to choose!! ps - I'm following you on fb and voted for ya too! I was introduced to your blog by a good friend of mine tonight, and I love it! I'm a new follower, and I love love love The Vintage Pearl, too. 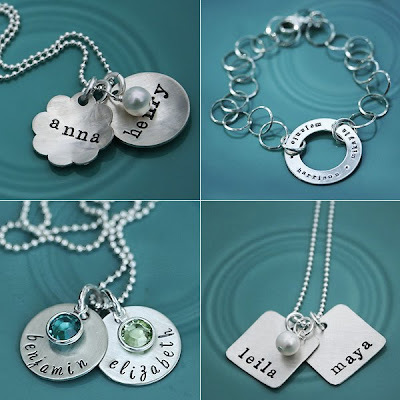 My favorite is the Layered Mother of Pearl necklace, but I would get a special quote meaningful to me and my hubby on it instead of names. I love the names on my heart piece. That would be my choice. I LOVE the stamped baby spoon! So Cute!!! I voted 4 you on top mommy blogs! I'm a follower! Love this blog! There's so many that I love, but I think my most favorite is the square names necklace. Thanks for the awesome giveaway! I love the eclectic charm necklace! I like being able to choose a diferent and uniquw charm for each of my 3 kids! I love the eclectic necklaces. I love different shapes, sizes and variety. So, so sweet. 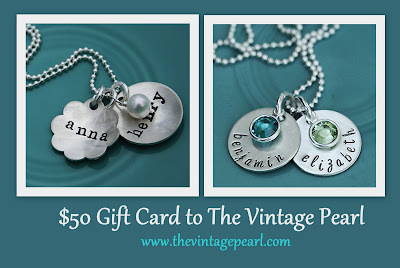 i think my favorite one is probably the "momma bird" necklace since i am obsessed with birds (and pearls!!). i love the simplicity of it but it is still able to make a great fashion statement. i just started to follow you and am excited to see your future blogs! i've posted Love Actually's Blinkie on my blog! I voted for Love Actually! I like the mother of pearl necklace! I just found your blog on FB and it is awesome! My goal this year is to work on my marriage and you have so many cute ideas to help me with that. Love, Love Actually! So fun. I voted for you, I follow you on FB now and the blog. I am a follower (your blog is saving my marriage) and I love the circle of love bracelet! count me for 3 entries! I am a follower, my favorite piece is the dainty initial heart necklace, and of course your button is on my blog! im a follower :) i LOVE the come follow me necklace! There are lots that I love. Dainty Layers is one of them! Hi! I am a follower! My favorite is "our family nest." I love your blog! You have the best ideas! I am smitten with the dainty initial heart necklace!!!! It's so lovely! I would have three custom charms made. Little rectangles stamped with my wedding date and my kid's adoption dates. The jewlery is absolutely beautiful, but I like the baby spoons in the keepsake section. My family loves ice cream and this would make a special, loving way to enjoy it. I would love the "names on my heart" necklace. i love love love the layered mother of pearl necklace. OOOOOHHHH I love the flower and a circle or the dainty drops for me the and the Mr. Can't wait to WIN!!! Permanent follower right here! I LOVE ACTUALLY!!!!!!! and I actually love the come fly with me necklace!!!! I became a follower of your blog & a Fan on Facebook. I also added your button to my blog. My favorite piece is the Dainty Drops. Thanks so much for your blog! It's really cute!